I knew I possessed super powers. I just had to sort through the baggage of a few generations to find them. When I was a kid I wanted to grow up to be Superman. This went beyond a normal childhood fantasy. I was sure that superpowers lay dormant within me. I remember jumping off the couch, absolutely certain that I could fly. I never quite got it but that didn't break my resolve. I felt that I had a gift to give to the world someday. I knew that I was special; it was just a matter of discovering how. Even throughout high school I'd go through different phases imagining myself as one superhero or another. I would design costumes for me and my friends and we'd parade around the streets of Manhattan dressed up as our favorite heroes. This was the best I could do at the time to lead a heroic life. Eventually I settled on becoming a journalist. That's not to say that it doesn't have its exciting moments, but who ever fantasized about becoming Clark Kent as a kid? In addition to writing talent, I also inherited my father's baggage. I inherited any writing talent I have from my father. When he was in college, he wrote a short story that won an award that was to be presented by Martin Luther King Jr. at his graduation ceremony. My father never showed up. It was the Sixties, non-conformity was in and going to graduation was considered very un-cool. The story was entitled "Me and Clark Kent" and was about a man who looks exactly like the mild mannered reporter. Everywhere he goes people mistakenly think he's everyone's favorite alter ego. He is not amused. It haunts him like a plague. He wants nothing more than to be free from the baggage that follows him around like kryptonite, to be accepted for who he is, not for how he looks. He tries going to psychologists, plastic surgeons, and personal trainers – nothing works. He continues to hear whispers whenever he enters a room, "Hey, that looks just like Clark Kent!" It begins to drive him insane. Finally in a fit of desperation, the suffering protagonist turns to self mutilation in the hope that it will bring an end to his pain. In the end, as he lies in the gutter unable to move or speak, he overhears a child whispering to her mother, "Isn't that Superman lying over there?" After all that self-hatred and escapism, he never realized the great potential he actually possessed. He never got behind the suit and the mild mannered personality to see that he really possessed the greatest power in the universe. My father never attributed much meaning to his story but I thought it was about a Jewish immigrant's desire to escape his roots. Just like the story's tragic hero, my father was unsuccessful in changing who he really was. He spent his entire life running away from his Jewishness. But this is not something one can easily escape. Eventually his children would have to come to terms with it, even though he never did. In addition to his writing talent, I also inherited my father's baggage and I wasn't going to just leave this skeleton in the proverbial phone booth. My father was born in 1941 in Presov, Slovakia, in the middle of the war. He remembers spending nights sleeping in the basement on top of potatoes, while the Russians and Americans took turns bombing the village. For him it was great fun. During the war, he and his mother stayed with a gentile family who passed them off as relatives. 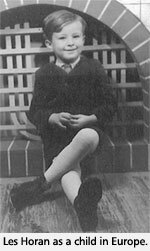 My father was three years old and it was too dangerous to tell him that he was Jewish. His mother dressed him like a girl so that no one would check to see if he was circumcised. They called him Lassie. One time some soldiers passing through the town thought he was so cute that they decided to take him on a picnic. His mother paced in panic the entire time he was gone. During the war, my father would call people "dirty Jews." He had no idea what a Jew was; all he knew was that they were disgusting and that he hated them, an attitude that he absorbed from his neighbors. One time he told his mother that when he grew up he would become a pilot so that he could bomb all the Jews. It must have pained her greatly to hear her son speak like that but she was too afraid to tell him the truth. After the war, my father moved to New York, with his parents and maternal grandparents. They were finally safe to be Jews again, and they sent my father, now seven years old, to a yeshiva day school in Manhattan. The only problem was that they still didn't tell him that he was Jewish! It never occurred to them that he needed to be told. His name went from Ladislav to Lassie during the war, and now in America it became Leslie, which nobody realized was also a girls' name. In yeshiva he was called Shlomo. His last name also changed from the Jewish sounding Berggruen to the Czech equivalent, Horan, in an effort to be less conspicuous lest another holocaust arise again someday in the future. At home, his parents had abandoned almost all of their Jewish practice, so when he arrived in a yeshiva he had no idea what was going on. Making matters worse, he didn't understand very much English. Since everything in America was so new to him, he never realized that it was a Jewish school or that he was a "dirty Jew." He figured that the new customs he observed were American customs. One day at show and tell, he told the class that he was going to have his first piano lesson on Saturday. Afterwards, one of the students approached him, asking, "Shlomo, are you Jewish?" My father stood there in silence. "Well don't you know that Jews don't take piano lessons on Shabbos?" He was a Jew -- the very thing that he had grown up hating. In an instant it hit him like a brick wall. He was a Jew. Suddenly everything made sense. He felt disgusted, embarrassed, and angry. He wanted to crawl away in shame. He was the very thing that he had grown up hating. He decided that the first chance he got he would leave the yeshiva and throw away his yarmulke forever. The opportunity came when it was time to apply to high school. 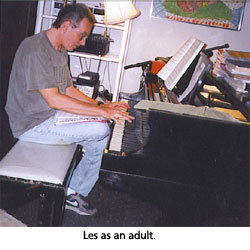 My father never stopped taking those piano lessons and he developed into a fine young musician. Music, the very thing that led him to realize his identity, would become his escape. He was accepted into Music and Art High School, a school for gifted musicians and fine artists. Music became a way for him to rebel against his Jewish identity. He took off his yarmulke and never looked back. It would have been the end of Judaism in our family, if not for the unrelenting twisting and turning of fate. I grew up indifferent towards Judaism. My father used to tell us how closed minded Jews were. He explained to us that the Jews of today were the stubborn ones who didn't catch on to Christianity when it was first started. Because Jews were so different than everyone else and had such weird laws, everyone always tried to kill them. These ideas instilled in me a desire to distance myself from Judaism as much as possible, although it wasn't hard to do so considering that our Judaism didn't go farther than lighting the menorah and occasionally making a Passover Seder, both my mother's doing. When I came of age and started searching for spirituality, Judaism was the last on my list. I started to travel the world and stopped telling people that I was Jewish altogether. I never bought into western society's cherished goals of striving for financial success and fame. I felt strangely out of place, as if I was living in a black and white world but I knew that somewhere color existed, it was just a matter of finding it. When I discovered the inner meaning of Judaism, it came as quite a surprise. It was like tripping over an old box that had been getting in the way for years only to discover that it contained a great treasure. Was this the superhero life that I was always searching for? Judaism showed me that it was no coincidence that I felt somehow special and different all my life. I discovered that as a Jew, I possessed a divine soul, a piece of Godliness itself. I had inherited a spiritual mission from my ancient forebears and possessed the power to change the world. I was part of a national mission to help fight the forces of evil in the world by striving to perfect myself and seeking to do good to those around me. It was no wonder I was never satisfied with a mundane existence. I wanted to live above nature -- to be supernatural. I would not be content until I was maximizing my full potential and bringing out the awesome power that lay within me. I discovered the path to find the hero within. He only saw the dark suit and glasses; he failed to see the blue and red costume hidden beneath the surface. When I told my father that I had started getting into Judaism, he was not happy. Although he tried to respect my choices and was even open to read the occasional recommended book, he would still lose his temper at me from time to time. "I hate the thought of my son becoming one of them!" he'd yell. "What do you gain out of following a bunch of archaic rules?" He only saw the dark suit and glasses; he failed to see the blue and red costume hidden beneath the surface. I was flying above the clouds, but he was stuck in the preconceived notions of the past. Who can blame him? As time passed, he softened up a bit. When my sister graduated college, she wanted to travel the world in my footsteps. She decided to start her world tour by visiting me in Israel. My father was furious. "Not you too!" He told her that she could stay in Israel for two weeks total, but no more. He was happy to let her travel the world indefinitely, but he refused to let her stay in Israel for too long. He claimed to be afraid of Arab terrorism, but I think he was really afraid of Judaism; he subconsciously feared that it might kindle a spark inside her as it did for me. His concern was not in vain. Not one week off the plane, and something started to churn inside her, something she had never felt before. She broke down crying on her first Shabbat, after we left a meal. "I want to know who I am," she cried. "I want to study what life is all about." Nonetheless she was afraid to change her lifestyle for a world that seemed totally foreign and different. As she was crying to me on a park bench, the daughters of the family with whom we had just eaten came outside and started dancing around giggling. They ranged from ages two to seven and were adorable. As the little girls climbed all over us in laughter, my sister eventually let her guard down. Judaism no longer looked scary to her; it was human and alive. She wanted to become a part of the Jewish chain of continuity. Today we are both married with children, and my father can no longer deny the fact that Judaism was the right choice for us, emphasis on us. The truth is that he really is happy for us. Just before my sister's wedding I asked my father if he had nachas from his children while he was playing with my six month old son, his first grandchild. "What does nachas mean?" he asked. "Nachas is the feeling that you get when you look at your children and you feel that you have succeeded in raising mature, responsible adults. It's the sense of pride and joy that comes from knowing that you have passed on everything that you have learned to the next generation. Nachas is a deep sigh of relief and contentment. Do you have nachas, Dad?" I asked again. My father didn't answer. He didn't have to. The smile on his face and the tears welling up in his eyes said enough. Thank you for sharing your beautiful story. May you continue to go from strength to strength. What a beautiful rendering of an amazing story. Yeyasher Koach. It often feels like, life, our lives, is a ferry tale, and the magic is seeing the threads that brought us forward, toward finding something hidden deep inside ourselves, That jewel. We all need to belong to something, and I think that something is far bigger than ourselves, as in this story. I also know, one could easily peruse other pages, Christian, Buddhist, Sufi, and beyond, and find similar stories of search and how one felt what one found, was a very particular form of identity, in diverse ways. The verse in all this, the poetry of journey, is in diversity itself, perhaps ONE verse, many iterations, of that ONE. And so it is, I honor all stories, of Lost And Found, and find myself on many pages of many books but everywhere, finding One Hand, the Hand that wrote all of us, into this glorrious but often sad, book of Life. And so I believe, for those whose search is interrupted, or who are cut down, in so many ways, that it's not over, when, it's over. Turn a page. ...we all want to feel good. when we can spin our history in a linear, moving and nice slice of apple pie we all feel so good. life is a little more ridiculous than this story. I will check back with the author in about ten years to see if all of this moosh held together. good luck. Gavriel, An amazing piece. I had no idea of your family background all these years. Hatzlacha. Oh...and I'm still waiting for the rest of those articles. Gabriel, Thank you so much for sharing your story with us. There is a special order to the Jewish soul, and how wonderful to hear your story and see how these events actually unfold. We would love to hear more. Your story has confirmed what I have also felt for 50 years. . My paternal grandfather was a quiet, solitary man who worked and interacted with his family only. He never belonged to organizations, or had many close friends and never professed any religion. He worked in a meat slaughtering plant a couple blocks from his house. I remember he would tell my Dad what what not to buy that week. He would call certain piece of meat treif. (I didn't know what that meant, but knew it was something bad.) I can see now that it was probably the closest he could get to keeping Kosher. I think my Dad might have known we were Jewish, and my Aunt lived as a Jewish woman might, without professing to being Jewish. She died recently at 94 and I remember she would have certain pans that she would cook vegetables in and a certain pretty dish for cottage cheese and a certain plate for meat. We had an order to how we washed dishes when I would stay with her, and a certain way to wrap the garbage after meals. I always thought she was just very fussy. . For the past several years I've been attending synagogue and taking Hewbrew Classes. I can look back now and see the influence of Kosher and observant qualities that survived for 4 generations. Because of your story I will share more of what I've studied with my grown children and become more observant. Perhaps we can add 2 more generations. This story is quite spiriturer and touching. Stories like this make any one try to see within them selfs who the really are. It is moving. When reading I felth some thing in me as to cry. God took you to the right place at the right time. Gavriel, this was so profound and full of truth, and I think also your magnum opus, at least so far (may your wonderful and inspiring works continue)! A little secret: When your father joined us for Shabbos so many years ago - (I think close to when your sister came for Shabbos, too)- I already saw and felt him experiencing nachas from you! Maybe then he was also still in major denial about it, though, and it was a great deal more subtle. bUt how beautiful to find him now in touch with the appreciation for your lives dedicated to Toras Emes. We miss you! Another casualty of WW 2. Gabriel's father is symbolic of all those lost children who survived the holocaust but never had a childhood.They grew up confused, angry and clueless about Judaism. Les was blameless for what happened and G-d rewarded him with wonderful children who found their way back. True Yiddish Nachas. Beautiful - Thank you Gabriel! I never wore a superhero costume in the streets of Manhattan - or maybe I did...Thank you for so gracefully articulating this beautiful perspective on the journey to yiddishkeit. I have often tried to convey to my parents and in-laws that our decision to become observant is not a rejection of them, but an actualization the great potential they have given us. May you continue to give a sach nachas to your family and readers. Thank you for the tears. Tears that you miraculously overcame great odds to return to your heritage. Tears that you father and grandparents had their Jewish lives hurt so badly by our enemies. Great inspiration. Great story. Great hearing from you again. Keep it coming. As a non-jew I didn't believe in Superman and Kryptonite. I now believe, that nachas may be the power of judaism ? The aticle is very woth of thought. This article is awesome. It touched the deepest crevices of my heart. May you always be a nachas to your ancestors and may you reap nachas from your future generations. This is a wonderful story about finding one's true identity. I take issue with only one point, and that is, the following sentence: I discovered that as a Jew, I possessed a divine soul, a piece of Godliness itself. I had inherited a spiritual mission from my ancient forebears and possessed the power to change the world. I am not saying I can possibly say this is wrong, in terms of the content but I can say that it does imply that others who are not Jewish do not possess this divinity and that must be wrong. I see that divinity dwells within us all, and that we are all of us, engaged in tikkun olam, and that when we say "do not give me things unbroken" this does apply to ALL of us, whether Jews or non Jews. God did not create a universe, surely, in which such powerful distinctions keep us apart. We are all of us a part, a deep part, of this creation and the one ness we must celebrate in One God, is just this. Truth is the best story! and enough tolerance and patience to allow different lives to grow and flower in different ways - truly a beautiful miracle. There really is so much to appreciate in what you have shared with us. Thank you! Thank G-d he married Jewish ! It's amazing to me, because he could have easily sought out a non-Jewish woman to marry, yet he didn't. I'm very touched by this story. So touching and deep. Thank you, and may you and your sister have lots of nachas too.